Home > News > Consider the Endosome: New Life for Neurokinin 1 Receptor Antagonists? Troves of preclinical data initially supported a key role for substance P, a neurotransmitter released in response to painful stimuli, in chronic pain. In clinical trials, however, highly selective antagonists against its receptor, the G protein-coupled receptor (GPCR) neurokinin 1 (NK1R), were unsuccessful. This led the pain field to all but abandon exploring substance P as a therapeutic target for pain. Now, researchers identify a previously unappreciated NK1R signaling pathway in endosomes and provide evidence that the failure of previous antagonists to target this pathway could explain why the compounds didn’t pan out. A collaborative effort among three teams at Monash University, Parkville, Australia, led by Nigel Bunnett, Christopher Porter, and Meritxell Canals reveals that NK1R within endosomes continues to contribute to pro-nociceptive signaling long after initial cell surface activation. 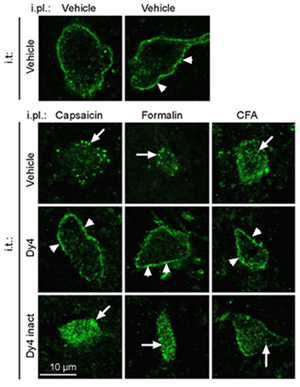 Blocking NK1R endocytosis inhibited this signaling and reduced capsaicin-, formalin-, and complete Freund’s adjuvant (CFA)-induced pain. Further, lipidation of a peptidic or a non-peptide NK1R antagonist to promote delivery to endosomes also relieved pain and did so better than cell surface antagonism. Since peptidic NK1R antagonists don’t normally gain access to endosomes but lipidation of both peptidic and non-peptide antagonists enhanced analgesia, these data suggest that a consideration of endosomal signaling may be important in efforts toward developing effective NK1R antagonists. “It’s fantastic work. It opens up a new way of thinking about pain by considering intracellular processes that may be involved in nociception instead of just GPCR signaling at the cell surface,” says William K. Schmidt, NorthStar Consulting, Davis, US, an expert on drug development who was not involved in the study. The work was published online May 31 in Science Translational Medicine. Targeting substance P/NK1R signaling has a tumultuous past in the pain field. Extensive preclinical data suggested a key role for this pathway in pain signaling. Painful stimuli cause the release of substance P from synaptic terminals of pain neurons within the spinal cord’s dorsal horn, where it binds NK1R on postsynaptic cells, propagating pain signals to the brain. Blocking this process in rodents with NK1R antagonists effectively relieved pain in these early studies, but when multiple pharmaceutical companies tried to bring this discovery to humans, they had no success (Steinhoff et al., 2014). As with other GPCRs, activation of NK1R initiates a cascade of intracellular signals. In a process thought to be largely responsible for regulating receptor activity, the plasma membrane around the stimulated GPCR forms a clathrin-coated pit that buds off into the cell, forming the endosome (Geppetti et al., 2015). Traditional thinking held that once GPCRs were internalized in endosomes, they no longer played a role in cell signaling. But recent work from the current study authors suggested this wasn’t the case. “This internalization was viewed only as a conduit for receptor trafficking, but recently, we’ve shown that GPCRs continue to signal in endosomes,” said Bunnett (Murphy et al., 2009). This GPCR endosomal signaling pathway has also been confirmed by other groups (Vilardaga et al., 2014). Since many GPCR-targeted drugs don’t pass into the cell, antagonists would block GPCR function at the cell surface but not within endosomes. “One of the potential reasons for failure with these drugs is that they’re unable to effectively target an ongoing signal from a receptor within an endosome,” explained Bunnett. So the researchers wondered if this could explain why previous antagonists targeting NK1R/substance P failed to relieve pain, and whether endosomal delivery of these drugs could enhance their pain-relieving effects. To explore this idea, the investigators first quantified NK1R endocytosis and endosomal signaling, turning to two molecular techniques that use fluorescence to follow NK1R throughout the cell and monitor its activity. With bioluminescence resonance energy transfer (BRET), probes emit light whenever NK1R is in close proximity to proteins embedded in the cell surface, early endosomes, or late endosomes. With fluorescence resonance energy transfer (FRET), probes emit light whenever key enzymes in the GPCR pathway are activated within the cell plasma membrane, cytosol, or nucleus. The researchers expressed NK1R in human embryonic kidney 293 (HEK293) cells and treated them with substance P. Using BRET, they found that the receptor did indeed move away from the cell surface and toward early and late endosomes, demonstrating the occurrence of endocytosis. Using FRET, they found that cell surface cyclic AMP (cAMP), cytosolic cAMP, and cytosolic protein kinase C (PKC) were activated; these enzymes are important players in GPCR signaling. Although there was transient activation of cytosolic extracellular signal-regulated kinase (ERK), another key enzyme in the GPCR pathway, there was sustained nuclear ERK activation. Using another light-emitting method, they found that ERK-induced transcription also occurred. In short, substance P induced endocytosis of NK1R with ensuing effects on multiple intracellular signaling processes. The team then examined the effect of blocking endocytosis with two different inhibitors of endosome formation, Dyngo4a (Dy4) and Pitstop2 (PS2), which inhibit dynamin or clathrin, respectively; these proteins are essential for endocytosis. Dy4 or PS2 inhibited NK1R from being endocytosed while also inhibiting activation of nuclear ERK, cytosolic PKC, cytosolic cAMP, and transcription. Thus, against the conventional wisdom, NK1R endocytosis appeared crucial for multiple downstream cytosolic and nuclear signals, pathways that would be off limits to any NK1R therapeutic unable to pass through the cell membrane. Substance P activation of NK1R induces not just immediate neuronal activity, but also prolonged activation thought to contribute to chronic pain. “Signaling at the plasma membrane is often transient. Once internalized, it would be astonishing if the receptor and ligand didn’t continue to signal from endosomes,” explained Bunnett. To explore whether the endosomal pathway was responsible for this sustained activity, the team performed patch clamp recordings on neurons in spinal cord slices. Substance P initiated NK1R endocytosis while causing robust neuronal activity lasting upwards of 10 minutes. In addition, although blocking endocytosis had no effect on the initial burst of action potentials, presumably due to cell-surface signaling, long-lasting activity was abolished. Testing this concept in mice, the team made hindpaw injections of capsaicin and extracted spinal cords 10 minutes later. They confirmed that the painful stimulation caused NK1R endocytosis and that it could be blocked by intrathecal Dy4 or PS2 injection. Furthermore, Dy4 or PS2 injected 30 minutes prior to capsaicin reduced allodynia, as measured with von Frey hairs. Similarly, blocking endocytosis with this strategy reduced pain in both phases of the formalin response and even reversed pain 36 hours after CFA injection. Critically, this effect on pain was greater than the partial and transient pain relief from the commonly used non-peptide NK1R antagonist, SR140,333. Although promising, blocking endosomal formation with Dy4 or PS2 is entirely non-specific. “We’re using clathrin and dynamin inhibitors here, so they would inhibit many different processes,” Bunnett said. To address this concern, the researchers devised a way to mimic a known NK1R mutation that prevents its interaction with β-arrestins, proteins required for endocytosis. They did so with a cocktail of three peptides that could effectively pass into the cell and specifically interrupt the NK1R-β-arrestin interaction. Intrathecal injection of the cocktail into capsaicin-treated mice again blocked NK1R endocytosis while suppressing allodynia. Based on the new findings, a possible treatment strategy for pain could be to deliver an already approved NK1R antagonist directly to endosomes. “We decided to look at this after reading a paper suggesting that lipid conjugation of inhibitors of beta-secretase, a target for Alzheimer’s disease, promoted endosomal delivery while enhancing efficacy. We thought to ourselves, ‘We could do this for NK1R’,” said Bunnett (Rajendran et al., 2008). So the investigators conjugated the well-known peptidic membrane-impermeable NK1R antagonist, spantide 1, to cholestanol (which promotes membrane insertion and anchoring of the antagonist) and named it Span-Chol. Once delivered, the antagonist would anchor to the cell membrane, waiting to be endocytosed. The researchers first tested this concept in NK1R-expressing HEK293 cells and found successful accumulation of the antagonist in endosomes after four hours. Critically, it could block substance P-induced nuclear ERK activation and transcription, events that occur because of the endosomal NK1R signaling. Then, again turning to spinal cord sections, they observed that Span-Chol pretreatment prevented substance P-stimulated sustained neuronal activity but not the initial burst of action potentials, just as blocking endocytosis did in the earlier experiments. Furthermore, intrathecal injections of Span-Chol in mice three hours prior to capsaicin injection, allowing for endosomal accumulation, reduced allodynia. The analgesic effect was greater than that of non-lipidated spantide 1. Similar findings were observed for both formalin- and CFA-induced pain. In addition, lipidation of the non-peptide NK1R antagonist L-733,060 also reduced allodynia in mice injected with capsaicin to a greater extent than when using non-lipidated L-733,060. It’s possible, however, that lipidation simply made Span-Chol more stable. But, the group found that Span-Chol was no more stable than the non-lipidated antagonist. “This was really important to do, and they did a great job showing that this effect is not simply due to increased stability,” said Schmidt. What’s next for NK1R antagonists? The obvious question is whether or not these findings resurrect NK1R as a therapeutic target for pain. “This paper is built on a model where peptidic antagonists are unable to enter the intracellular environment to interact with endosomal processes. A lot of the compounds tested in the past, however, are non-peptide antagonists and might have intracellular access,” explained Schmidt. “Before we jump back into looking at NK1R antagonists and pain, we need to consider whether non-peptide antagonists gain access to the intracellular environment,” said Schmidt. Still, the study establishes endosomal GPCR signaling as a potential avenue for future exploration. “The rationale behind these experiments was to understand the intricate function behind GPCR signaling in endosomes, not necessarily to find a new pain therapeutic. I’m very pleased, however, that this may have implications for treating patients,” said Bunnett. The study also raises the question of whether endosomal signaling by other GPCRs involved in pain or even in other disorders plays a role. “With almost a thousand members, GPCRs are the largest receptor family. They are the target of one-third of all therapeutic drugs, making this endosomal signaling pathway broadly applicable. We already have evidence that it may even be involved in signaling of other pain-related GPCRs,” said Bunnett. Image credit: Jensen et al., 2017. Jensen DD, Lieu T, Halls ML, Veldhuis NA, Imlach WL, Mai QN, Poole DP, Quach T, Aurelio L, Conner J, Herenbrink C K, Barlow N, Simpson JS, Scanlon MJ, Graham B, McCluskey A, Robinson PJ, Escriou V, Nassini R, Materazzi S, et al. Sci Transl Med. 2017 May 31; 9(392). Endosomes: a legitimate platform for the signaling train. Endosomal generation of cAMP in GPCR signaling. Efficient inhibition of the Alzheimer's disease beta-secretase by membrane targeting.